Welcome to the Geeks in Heat Event! Oh, I bet that got your eyeballs! “SUMMER”. It means nerds in the summer, O challenged one, gutter brain, thou. Big Head Bob wants to welcome everyone to the hot, clear, shiny, azure-skied days with open arms and short sleeves! And a few funny shirt designs, of course. 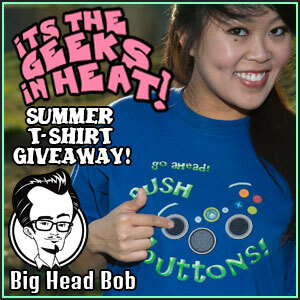 Big Head Bob, home of fun shirts and stuff for gamers, fans and nerds, started off the summer with a bang; a new design for the Fourth of July – “Let’s Blow Something Up!” Not just for the 4th, mind, as it doesn’t really come from firecrackers. It comes from a love of the TV show Mythbusters, in which a ‘normal’ episode often includes some kind of (large) explosion. Said BOOM is often pushed a bit beyond the envelope of safety (for the sake of the fans, of course). Couple sticks of dynamite, a wad o’ C4, dash of this, propane tank that… Recipe for ‘Large Bang’! Where else could you watch people trying to blow up a house with a truckload of popcorn? For Big Head Bob, the first sign of ramping up for the summer came with their Towel Day design. Summer = beaches, tans, pools, the outdoors, sweat, water bottles – that kind of thing. So, a towel goes with all that, and every hitchhiker in the galaxy should be so equipped. SUMMER is officially ON, so put a smile on your face and start having FUN! Vacation is a way of life, in your mind, all the time. 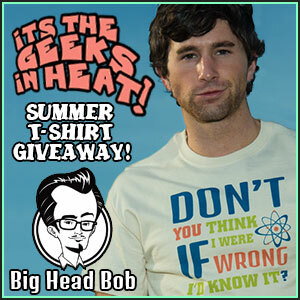 To get everyone else in happy summer mood Big Head Bob is offering 25% off EVERYTHING. 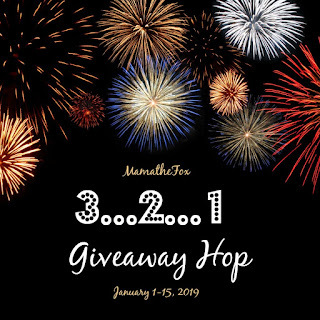 Now, where did I leave my shades AND on to the giveaway! 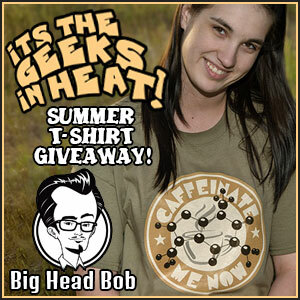 Two lucky winners will each receive a $50 Big Head Bob eGift Code! This giveaway is open to US residents and ends July 12, 2013 at 11:59pm est. Disclosure: I received no compensation for this publication. My opinions are my own and may differ from those of your own. Lisa-Queen of Random is not responsible for sponsor prize shipment. If you have any questions or want to see your business featured on the next big event please contact tina@babycostcutters.com. 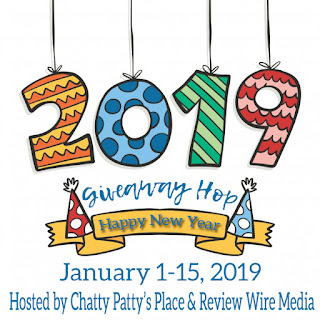 Swim, Sun & Fun Giveaway!! #BloggerOpp ~ $200 PayPal Cash Giveaway!